Gurdwara Charan Kanwal is situated in Machiwara, 35 km from Ludhiana District of Punjab. There are many religious connotations associated with this place. It is said that Gurdwara Charan Kanwal at Machhiwara is the place where Guru Gobind Singh was founded by his three companions Daram Singh, Daya Singh and Man Singh, who were separated at the time of his escape to the forest from the enemies ,while fighting a guerrilla war against a massive Mughal force. They saw that Guru Gobind Singh is sleeping on some bushes on the ground in the garden with a stone as his pillow. This holy shrine has a beautiful traditional building surrounded by a beautiful garden which was built in memory of this historical event. 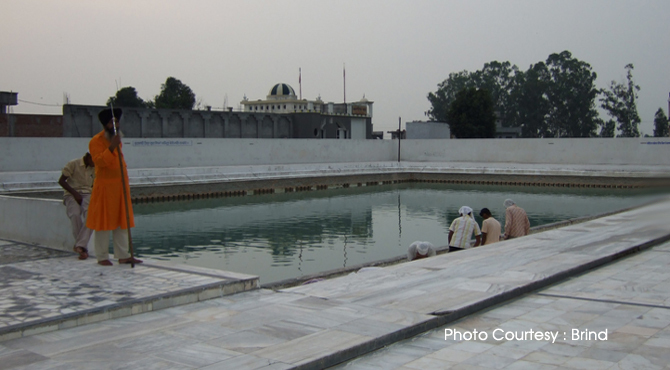 Guru Gobind Singh drank water from a well which appears in the foreground, that is used to water the garden. The annual festival of this shrine is held in December ( 9th & 10th of Poh) , the days of which Guruji stay at Machiwara. There is also another shrine in Machiwara called as Gurdwara Chubara Sahib. This shrine is situated in the place where he and his 3 companions were given shelter by one Masand Gulaba Singh in his house to escape from the enemies. It is in this spot he sang "Mitra Piyare Nu". There is another Gurudwara in Machhiwara called Gurdwara Ghani Khan Nabi Khan. It is the house of two Muslim Pathan brothers Ghani Khan and Nabi Khan who help the guru and his 3 companions from the Mughal army, by putting them the blue robes of a Muslim.